A Master Swordsman's Power is an Equipment Set available in Nioh. Forged using the Exotic Forging Material Kappa Shell. Despite being an Equipment Set centered around Dual Swords; which are typically associated with Ninjas and Light Equipment. This Equipment is Heavy. Players do not have access to their Guardian Spirit, Weapons, Omyo Magic, Ninjutsu, Items or the ability to co-operate with another Player during this Dojo Mission. All of which are things that can increase Luck and Item Find. This makes obtaining the Smithing Texts particularly difficult. 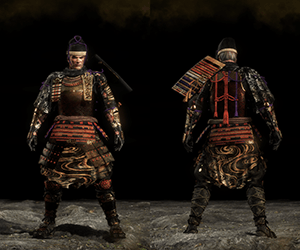 Belonging to a Clan that increases Luck, using the Hunter's Boon Kodama Blessing, wearing the Kodama Bowl Helmet, and two Accessories with Luck and Item Drop Rate are all things Players can do to aid in their chances of recieving the Equipment or Smithing Texts.